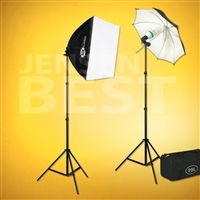 Product Code: 34120 This is a new PBL photo/video studio lighting kit 650 watts. Product Code: 3460 Photography and video production ready 500 watts. Product Code: 34604 This is a new PBL photography and video studio lighting kit with a new support system and 6x9ft muslin background, 650 watts. Product Code: 342022 This is a new PBL photography and video studio lighting kit with a new support system and chroma-key green screen backgrounds 650 watts.